When I was a kid, I loved it when my mom bought us tri-colored sherbet. You know the kind—a big tub of bright raspberry, neon lime, and summery orange sherbet all nestled together. To this day, I think sherbet tastes like summer, and when I want to weave something that screams sunshine, I turn to my sherbet palette. This is probably why I fell in love with Deborah Bagley’s Which Way Market Bag from Easy Weaving with Little Looms 2018 immediately. 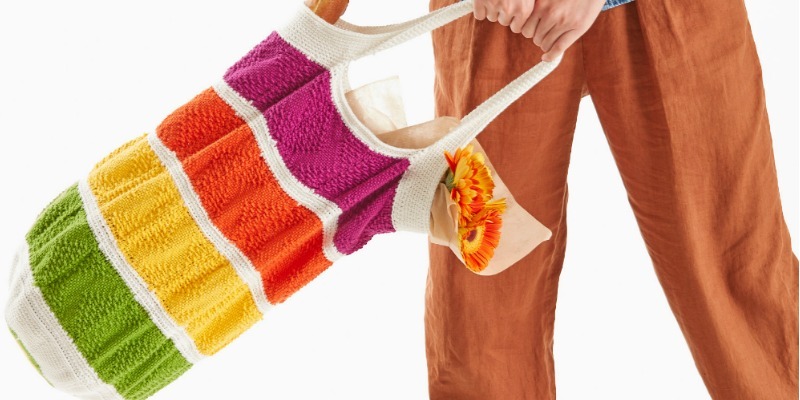 The bag just looks like summer with its summer rings of color. While it’s technically in the At the Market section of the magazine, I can easily imagine using this as a beach bag—it’s just the right size for a novel, some sun lotion, and a rolled up towel. Deborah Bagley’s Which Way Market Bag is the perfect summer weaving project. Even better, not only does the project look summery, it’s also a perfect summer weaving project. Those gorgeous rings of color are made up of pin-loom woven squares, and while most looms aren’t conducive to weaving outside or on the go, pin looms are pretty much made for weaving at the park, by the pool, or anywhere else you please. The squares are simply pieced together with a bit of crochet to create a wonderful bag with just the right amount of stretch. As an added bonus, the project is written so you can weave chevron designs into your pin loom squares using strategically placed floats. 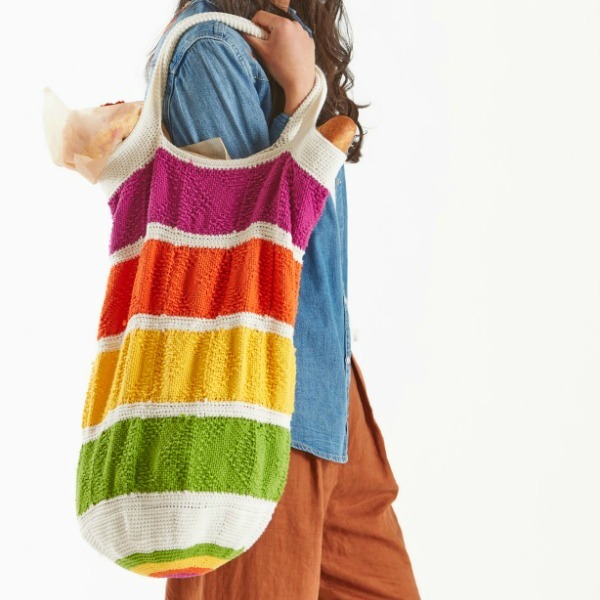 The bag would look amazing in simple plain weave, but if you want to up your pin-loom weaving repertoire the Which Way Market Bag has you covered! Featured Image: Bring a bit of summer to your pin loom with Deborah Bagley’s Which Way Market Bag. Equipment Needed: 4” x 4” pin loom; 5” weaving needle; tapestry needle; size G-6 (4 mm) crochet hook. Yarn: Jeannee Worsted (Plymouth Yarn) #8 White; #53 Orange; #54 Purple; # 55 Green; #56 Yellow.